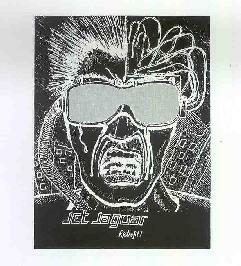 Jet Jaguar are a new 3 piece act from Albuquerque, New Mexico. Seeing as I lived in New Mexico for 8 years of my life, I am always curious what kind of music comes out of there. The band describe themselves better than I can, "a mutant hybrid of the Motorik sound of Neu!, the art-punk-industrial ethos of Chrome and some of the psychedelic preoccupations of Hawkwind". The Hawkwind influence is very strong on the song "Dogfight", which is a pretty close approximation to "Ejection" when it comes to the guitar riff. I really think the band have some great layers of synthesizer sounds going in the background of their songs but they all have this sort of harsh-metallic production quality, like the Chrome-Helios Creed matierial "The Mutated" is an excellent track with some great psychedelic guitar soloing. "X-Ray Of A Neon City" closes the CD and is a laid back track, not so frantic with some beautiful Spanish influenced acoustic guitar. I found myself totally absorbed in the songs on this EP and can't wait to hear more from this group. For more information you can email Jet Jaguar at: outworlder5@hotmail.com. This 6 track CD-EP can be purchased for $6 via snail mail from Charles Van de Kree; 4800 San Mateo Ln NE #142; Albuquerque, NM 87109.